Envelop yourself in the tenderly flowing words of romantic poetry in the unforgettably lyrical collection, A Dime Is A Sign: Poems of Love & Loss (Feelings Into Words) by Sherrill S. Cannon. Life is full of love and loss, but at times we experience our feelings and emotions so intensely, we can't put them into words. Allow the soft fluidity of the gentle poetry to caress your soul and bring comfort to your mind as you read through the sublime sonnets, poems, haiku, blank verse, and free-flowing verses. Each poem is meant to help convey a moment of deep emotion, and speak straight to the soul to help you better process each unique stage of love you experience. The delicately soothing words invite you to float lightly among the author's words and get lost in love. A Dime Is A Sign: Poems of Love & Loss (Feelings Into Words) by Sherrill S. Cannon is a breathtaking book of romantic poetry. As a school teacher, wife of fifty-eight years, mother, and grandmother, Cannon has lived her words, writing them down throughout the years to help counsel teens and friends through love and heartache. Love and romance are beautiful, but loss can be tragically painful. We often ask ourselves, "Is it worth the pain to love?" The poems in this collection have answered with a resounding, "yes." The words moved me. Every word of every line held beauty and meaning. The poetry is based on the different stages of love -- from young, new love, to older forbidden love -- and the verses in this book were written to speak to both young teens and older adults. 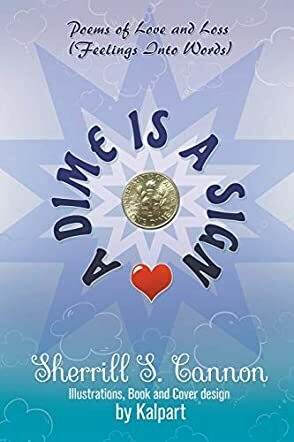 A Dime is a Sign: Poems of Love and Loss (Feelings Into Words) by Sherrill S Cannon is a compilation of poetry and the second book of verses that Cannon has released, preceded by A Penny For Your Thoughts. The poems are divided into three sections: Heads...of Love and Friendship, Spinning – Of Related Emotions, and Tales...of Heartache and Anguish. Within each section the individual poems are in alphabetical order, which to me is an appropriate nod to an author who spent years as a teacher. Most of the verses are rhythmic and lyrical, reading in almost a sing-song melody. Some, like Rainy Day Thought, are in free-form, rich with inflection and powerful choral qualities. A Dime is a Sign is such a beautiful piece of work. My favorite is It Doesn't Matter, which speaks of an unrequited love but does so in a way that discharges the usual somber tone that a poem about loving someone and not being loved back generally delivers. Instead, Sherrill S Cannon is somehow able to make it sound like it is okay – it's perfectly fine – because, “For my heart, you have a part...And with my love, you help me live.” The best way to describe how Cannon's poetry makes me feel is with the use of the word 'inspired'. Her heart and soul are poured out onto each page and drip from each line, and still, even when the stanza reads in a lilt of restraint, Cannon elevates the message and inspires the heart. “A psychic medium once said that if you find a random dime, it is a sign that someone you have loved and lost is thinking of you.” A Dime is a Sign: Poems of Love and Loss (Feelings Into Words) is a collection of poetry by Sherrill S. Cannon. It is broken up into three parts, and each part’s title uses the dime as a metaphor, and each part contains certain subject material such as love, loss, friendship, emotions and so forth. Poetry is a tricky form of literature to fully grasp or find appealing because it has several different layers to it. Poetry is part literature, part art, and impressions are always absolutely subjective. With that said, I found myself taken aback by how much emotion Cannon’s poetry drew from me. A Dime is a Sign woke up my inner hopeless romantic. Sometimes poetry can take the heart somewhere a whole book can’t; there is something more personal between the writer and the reader when poetry is in the mix compared to a full-length novel. Sherrill S. Cannon plays as the conduit between the reader and the lyrically crafted words. I find that when something is relatable it means a whole lot more to the reader and I believe that is why I enjoyed my time reading A Dime is a Sign: Poems of Love and Loss (Feelings Into Words). The poems we love say a lot about us as people; some of my favorite poems from Cannon’s book were “Forever,” “Parting,” and “Revelation.” I would recommend this to people who have a hard time expressing their feelings in words.